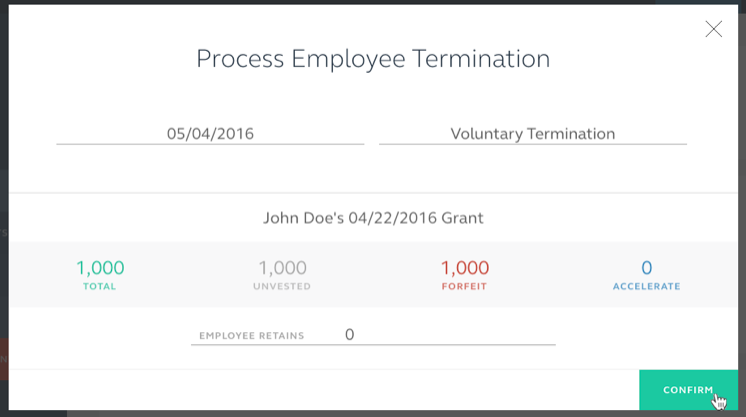 What if I need to terminate an employee? Click on COMPANY and then select CONTACTS. Then you want to click on the row of the person you wish to terminate. For our example we want to terminate John Doe. This will bring up their profile. On the left side of the screen you should see an option in red that says 'Terminate Employment'. You want to click on TERMINATE EMPLOYMENT. You then will be prompted to enter the date of termination and select the reason for termination. After you have entered and selected those details you will see the total options granted to the person, number of options unvested, number of options forfeited, and any accelerate. Below those number you will see any options that the individual retains. **If the employee retains any options you will be prompted to enter the period of time the individual has to exercise the options they retained. Once you have entered in or selected all the necessary details click on CONFIRM. **This will also stop any vesting on all options issued to the person being terminated. How do I stop vesting for options issued?